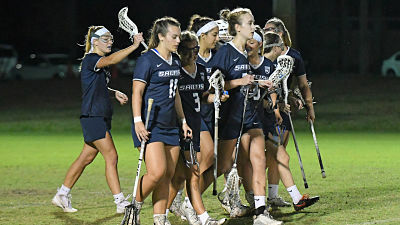 HARTSVILLE, S.C. – Palm Beach Atlantic women’s lacrosse put their season into motion on Thursday night, taking on Coker College in their first nonconference road game in program history. The Sailfish jumped out to an early two goal lead and held on for a 26-22 victory. PBA never trailed in the first half as they took the early 2-0 lead off goals from Kiki Cinotti and Grace Bartlinski. The Cobras tied it up at 2-2 just two minutes in before the ‘Fish started to get some separation. The Sailfish led 7-4 and 9-5 before Coker closed the half with three of the final four goals. PBA led 10-8 at the break as Cinotti and Bartlinski each scored three times. Coker opened the second half with four goals in just over two minutes to take a 12-10 lead but PBA answered with six straight over the next five plus minutes to lead 16-12. Anna Laskaris scored twice during that run, her first two goals of the season. The Cobras made one more strike, scoring four straight to tie the game at 19-19 with 12:34 to play, but the Sailfish closed with two separate three-goal runs to provide some distance. Cinotti scored twice during the first run as she finished her first collegiate game with a team-high eight goals and added an assist to finish with nine points In the second run the ‘Fish twice scored while playing down a man. Grace Bartlinski scored four times and finished the night with six points as the Sailfish saw nine players score and 10 record a point in the game. Laskaris finished with three goals and an assist while both Shayna Rogers and Chelsea Smith each scored three times. Lindsey Heffler added two goals with Kate LeBlanc providing two assists and a goal. Alyssa Yates and Abby Heffler also scored a goal. Abigal Nehring made 12 saves in goal for PBA while Cinotti led the team with three ground balls. PBA took 49 shots in the game compared to 43 for Coker. The ‘Fish dominated with 31 draw controls as the Cobras secured 16. PBA is back in action on Saturday as they make the trip from South Carolina to Georgia to take on Shorter University at 1 p.m. The ‘Fish defeated Shorter last season for the program’s first win. PrevEpoch Lacrosse Sponsors the Sunshine State North vs South Showdown on June 4th-5th!